In the past twenty years dentistry, with its associated advancements in technology, has improved to a point that it can give the results past generations have only dreamed of. It is no longer only possible to keep all our teeth for life, with the availability of modern, advance materials coupled with the better knowledge that comes with more informed dentists, one can provide patients with endless aesthetic possibilities to improve and make ordinary teeth look great. Read on to find out more about what you can expect from professional cosmetic dentistry at Bondi Dental. Famous Hollywood stars have long known that improving their smiles by cosmetic dentistry significantly enhances their appearance, make them look younger and contribute to the success of their career. A “Hollywood smile” has become everyone’s dream. A well planned and designed set of teeth will not only brighten your smile and give you more confidence, but will also dramatically contribute to a more youthful appearance. Thanks to modern technology and new dental materials for use in professional cosmetic dentistry, it is not only possible to have the “Hollywood smile” or the “beautiful smile” that you dreamed of, but at much more affordable prices. Laminated composite veneers is a simple procedure of applying tooth coloured materials to change the shapes, sizes and colour of your teeth. It requires no cutting or preparation of teeth and is totally reversible. It is painless, cost and time effective. In a matter of hours you can have a completely new and bright smile. Jack Vidgen’s new smile was created by Dr. Andrew Sih a year ago, and Jack loves his new teeth. If you want to know more about laminated composite veneers, please contact us now at 9365 7187 and make an appointment with Dr. Andrew Sih. Many people would love to have a “Hollywood smile,” especially those who have gone through life feeling self-conscious about their smile. If you have missing teeth, or your teeth are crooked, misaligned, ill-shaped, chipped or worn down, or if you have severe tooth discolouration that might not be adequately corrected by teeth whitening, our cosmetic dentist, Dr. Andrew Sih, at Bondi Dental can develop a customised treatment plan that is suited to your needs. Chairside Laser (LED) whitening at our dental surgery in Bondi Beach using high quality LED lamp and whitening gel imported from the United States. This procedure provides much faster and more extensive results. However, if you have very sensitive teeth, Bondi Dental recommends a ‘take home’ Professional Home Whitening System’ which can whiten your teeth in about 10 days, in the comfort of your own home. If you have severe discoloured teeth that cannot be adequately corrected by teeth whitening, or if you have crooked, misaligned, ill-shaped teeth and do not want to go through the more time consuming process of orthodontic treatments, then dental veneers may be the answer for you. Bondi Dental offers both porcelain veneers and laminated composite veneers which can straighten, brighten and beautify your smiles. Both of these procedures are highly effective. With composite bonding, our Bondi Dental cosmetic dentist Dr. Andrew Sih can reshape your teeth by using a dental tooth coloured filling material called composite. If you have a chipped tooth or minor fractures, the bonded composite will restore your tooth to its natural shape and appearance, oft en with only one visit to the dentist. In the past, the only solution to replace a missing tooth is dental bridge, which requires cutting and preparing two ‘good teeth’ for the abutments of a bridge with “pontic” to replace the missing tooth/teeth in the middle. Thanks to modern dentistry, dental implants can/may now be used to replace a single tooth or multiple teeth without involving any of the good adjacent tooth/teeth. Dr.Terry Yuen, a top dental surgeon in Adelaide. In the past 20 years, Dr. Yuen has successfully carried out over 1000 cases of dental implants. Dr. Yuen is in charge of planning and the surgical procedures of the implants. Dr. Andrew Sih, our top cosmetic dentist at Bondi Dental. Dr.Sih has over 30 years experiences in dentistry and specializes in cosmetic dentistry. Dr. Sih is in charge of planning, co-ordinating the final prosthesis to the implants. For some more severe disfigurement in a tooth/ teeth, to cover the entire tooth/teeth with dental crown/crowns may be the only option to overcome the cosmetic requirement. . Dental crowns/bridges are often used in restorative dentistry to strengthen broken down teeth or to replace the missing teeth to enhance function, eg. chewing. But dental crowns also can be used in cosmetic dentistry as well. Dr. Andrew Sih at Bondi Dental, will examine and evaluate the condition of your teeth to determine if you require dental crown/crowns/bridges, which may provide a more adequate and long-lasting solution for your particular problems. Cosmetic dentistry is not just about teeth, it can be an experience that can affect a person’s complete outlook and can also be life-changing. Therefore it is of vital importance that you should know what to look for in a cosmetic dentist. Experience: You don’t want to be in the chair when you find out that a dentist is trying something new for the first time. At Bondi Dental, our dentists Dr. Andrew Sih and Dr. Terry Yuen have over 60 years of combined experience in cosmetic dentistry. No matter what kind of dental problems or difficulties you are facing, chances are that the dentists of Bondi Dental, Dr. Andrew Sih and Dr. Terry Yuen have encountered and rectified before. Professional skills: As cosmetic dentistry involves top clinical skills, both Dr. Andrew Sih and Dr. Terry Yuen set very high standards for themselves and are constantly upgrading and improving their skills; coupled with their extensive experience, they are always able to achieve the most satisfactory results for their patients. Consultative approach: Getting cosmetic dental work can be a big decision, and it can be costly. You should expect your cosmetic dentist to be willing to sit down and talk with you about the decision. 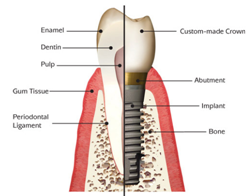 At Bondi Dental, both Dr. Andrew Sih, and in the case of dental implants, with Dr. Terry Yuen, will spend time examining, listening and discussing with you your concerns, needs and requirements. After careful considerations, they will then suggest the best treatment option/options and will explain to you the reasons for their thoughtful recommendations. Attention to details: Cosmetic dentistry is an art, and attention to details is very important. Dr. Andrew Sih is an artist and a perfectionist. When he does a cosmetic procedure, he pays particular attention to minor detail from every angle, such as colour tone, translucency, shapes and sizes, as a slight variation in each will affect the overall effect. Clear explanations: When you go in for cosmetic dental work, you should expect your dentist to carefully and thoroughly explain the changes that are going to take place as a result of your treatment. There should be no surprises! At Bondi Dental, our cosmetic dentist Dr. Andrew Sih will discuss with you in detail about the process, patiently explain what is going to happen, seeking your approval at each step of the treatment, and keep you feeling confident and calm about the process and happy with the results. Knowledge of facial features and proportions: A good cosmetic dentist should have adequate knowledge on the proportion of facial features to determine the ‘perfect’ smile suited for each patient. Dr. Andrew Sih, with his years of experience and studies, has acquired useful knowledge to help him create a ‘beautiful smile’ with due consideration to factors such as the smile line, the jaw line, the gum line and the lip line. Good aesthetic sense: Every good cosmetic dentist should, in fact, be an artist. As cosmetic dentistry involves reshaping the style and appearance of a patient’s teeth, i.e. smile which will have a lasting effect on the patient’s life, the cosmetic dentist must have ‘an eye for beauty’. When you are looking for a cosmetic dentist, maybe you will ask yourself: Does this dentist seem to have an aesthetics sense and a zest for his work? Does he have a sense of style? Dr. Andrew Sih has strong aesthetic sense. Like an artist Dr. Sih can ‘vision’ and then ‘create’ the smile most suitable and pleasing for each and individual patient. To Dr. Sih, technical skills is an important part, but so is the artistic side. He is attuned to his patients’ aesthetics needs. Sensitive to patients needs: When dealing with cosmetic dentistry, a cosmetic dentist not only just deals with the technical and aesthetics aspect of a patient’s teeth, he should also care for the emotional needs of his patients as well. Dr. Andrew Sih understands the emotions and concerns of patients coming to him for cosmetic works. He will carefully examine their oral conditions, and patiently discuss with his patients the reason for their concerns, their needs and requirements, giving them professional advice on the best solution and approach to their problems, assuring them of the successful outcome. He will constantly obtain their approval during every stage of the procedure and to make that his patients will walk out with a ‘beautfiul smile’ on their faces. “If you are happy, I am happy”, says Dr. Sih.